To connect most E-TEC engines to a NMEA-2000 network a specialized drop cable is needed. However, I must note that the latest generation of E-TEC engines with the 74-degree V6 block are using the standard connector, and my comments about a special drop cable do not apply to those new models. The connector at these legacy E-TEC engines is not the standard DeviceNET connector used almost universally now. The E-TEC interface uses a four-pole AMP Superseal 1.5 connector. You can buy a pre-made cable for this interface, but the MSRP of the cable is $99. For a 15-foot cable with two plastic connectors that is expensive. It is possible to make your own specialized NMEA-2000 drop cable to connect to the E-TEC. The method I would use would be to buy or obtain or fish out of your spare parts box a regular NMEA-2000 DeviceNET extension cable. Cut off the connector with the sockets. 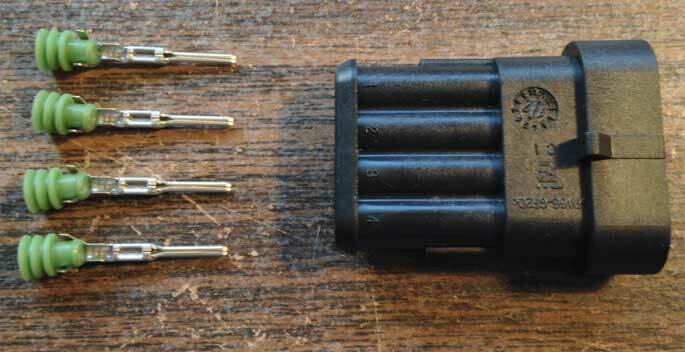 Use the remaining cable and connector with pins to make your own drop cable for E-TEC. Strip back the cable to reveal the five conductors. The conductors should follow the standard color code. (See below.) If the extension cable you cut into two does not use conductors with the standard color code, all bets are off. Fortunately, almost all NMEA-2000 pre-made network cables will use the standard color conductors. Order the little plastic connector body, contacts, and seals from an electronics vendor like MOUSER. They usually have these parts in stock. Assemble the four-pole connector to the cut-off end of the extension cable. Everyone has an extra NMEA-2000 cable lying around--don't you? That part would be free. You can make your own drop cable for an E-TEC for about $6 and perhaps 30-minutes work. Since that would save $93, it might be worth it. The shield or drain of the cable is not connected at the engine end of the cable. Cut off the drain conductor and insulate it away from the others. Usually you bend the drain back and cover it and some of the cable with heat-shrink tubing. Of course, you get the heat shrink from your spare parts or connector parts kit that every electronics experimenter has on their work bench. Before inserting the contacts into the connector body, be certain everything is correct. It is very hard to get a contact out of the connector body once it snaps in place. Also, order a couple of extra contacts in case you make a mistake crimping one of them. I have not yet made a drop cable like this myself, but I have ordered and received all the parts shown. I have compared them to the OEM cable, and I am satisfied the connector components are the same and the wiring is as I indicate.